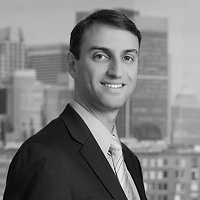 Matthew Connolly, a senior associate in Nutter’s Litigation Department, has been honored as a “2017 Up & Coming Lawyer” by Massachusetts Lawyer Weekly. Attorneys selected as “Up & Coming Lawyers” have been members of the Massachusetts Bar for 10 years or less, yet have already distinguished themselves in the practice of law. Matt will be recognized for his accomplishments at the annual “2017 Excellence in the Law” event on April 27, which celebrates excellence throughout the legal community.